Kia ora – I’m Louisa Hormann and I am a History Honours graduate of Victoria University. With the 100 year anniversary of the First World War upon us, it has been my job this summer to research and update Te Papa’s First World War Collections Online. I have discovered that doing museum research is a bit like doing detective work. In the past, people didn’t keep as detailed records as is common museum practice today. As a result, we unfortunately have many ‘tricky objects’ which are completely under-documented and which we know practically nothing about. 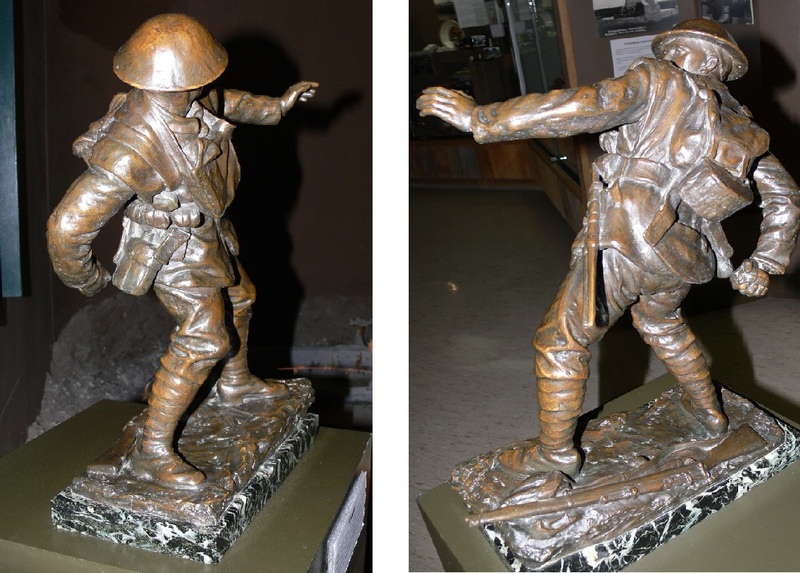 Alexander R. Fraser’s bronze sculpture of a First World War New Zealand ‘bomber’ is one such object. This small but impressive artwork is currently on loan to the National Army Museum Te Mata Toa. Starting out, all we knew about this statue was that it was made by Fraser and was displayed at the New Zealand Academy of Fine Arts (NZAFA) Autumn Exhibition from 12 May to 4 June 1951. In 1954, the NZAFA gifted the sculpture to the National Art Gallery (which became part of Te Papa in 1992). The logged production date was circa 1951, following the date of its first known exhibition. To me however, this date seemed an unlikely estimate. 1951 was so long after the war and did not coincide with any major anniversary commemorations of the war or its battles. I think the sculpture was more likely to have been made in the 1920s, a period when countless memorials to the Great War were designed by artists worldwide. To begin with, there isn’t a lot known about Scottish-born Alexander Roderick Fraser (1877-1953). He first trained as a sculptor and stonemason, and in 1901 arrived in New Zealand to teach sculpture and modelling at Wellington Technical College. Fraser taught from 1901 to 1910, and then returned to England. There, he studied sculpture at the Royal College of Art and the Royal Academy Schools. He was a New Zealand member of the Royal Society of British Sculptors, and served as a draughtsman with the British Flying Corps 1916-18. 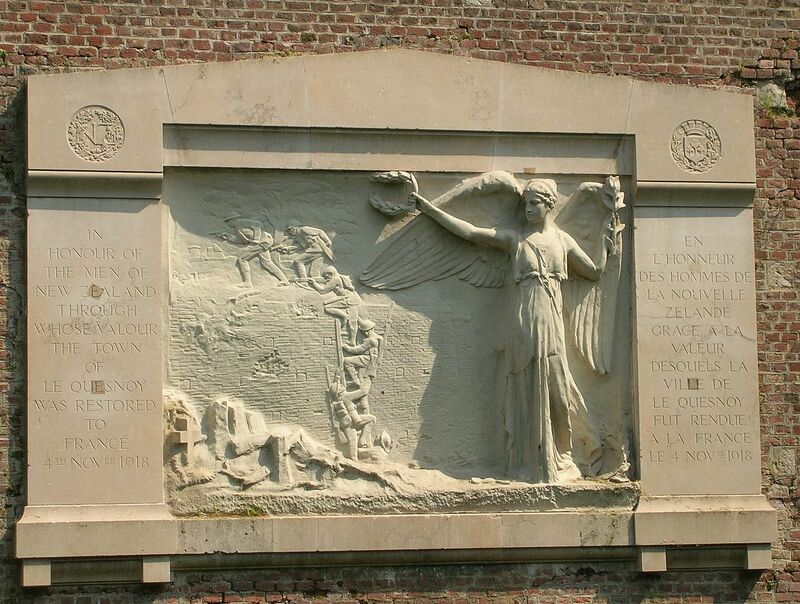 After the war, Fraser was commissioned to design and execute commemorative art for the First World War, especially remembering New Zealand’s service in France; he completed the famous panel at Le Quesnoy and another piece in Amiens. He returned to New Zealand in 1937. A tip-off by curator Mark Stocker directed me to Chris Mclean and Jock Phillips’s reference to a 1921 bomber sculpture by Fraser in their book The Sorrow and The Pride (p.113). 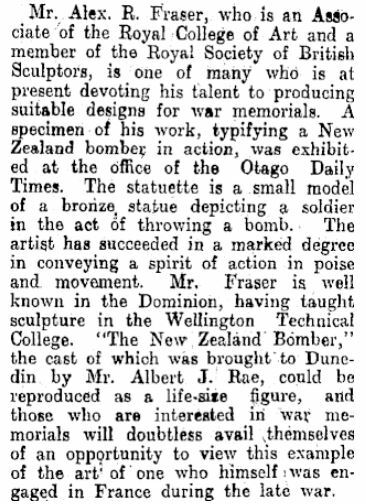 Newspaper articles on Papers Past confirmed that Fraser exhibited a New Zealand bomb-thrower in 1921, following Christchurch sculptor William Trethewey’s ‘The Bomb-thrower’ in 1920. The sculpture itself was described in a 1926 report of the Dominions’ Artists exhibition in London as being made from bronze and only about 18 inches high. While this size has been corroborated by the National Army Museum, the article’s description of the statuette as a ‘small model of a bronze statue’ might suggest that more than one copy of the original was made. Te Papa’s sculpture was gifted by the New Zealand Academy of Fine Arts to the National Art Gallery in 1954, the year after Fraser’s death. My research at the Turnbull Library revealed Fraser was elected to the NZAFA Council on 1 February 1950 and actually died while in service. According to the 1954 annual report, ‘The Bomber’ was then purchased from T.G. Macarthy Trust funds and presented to the National Collection. What we don’t know is whether our sculpture is the same ‘Bomber’ mentioned in these articles. Sculptors create moulds and it wasn’t unusual for artists to make multiple casts from a single mould. What is notable is that our sculpture is bronze, a very expensive material at the time. Providing Fraser only made one bronze version of the sculpture, we could assume that Te Papa’s bomb-thrower was in fact created much closer to the end of the First World War – at least as early as 1921, if not earlier. Neither Trethewey or Fraser’s bomber designs were adopted as public war memorials. 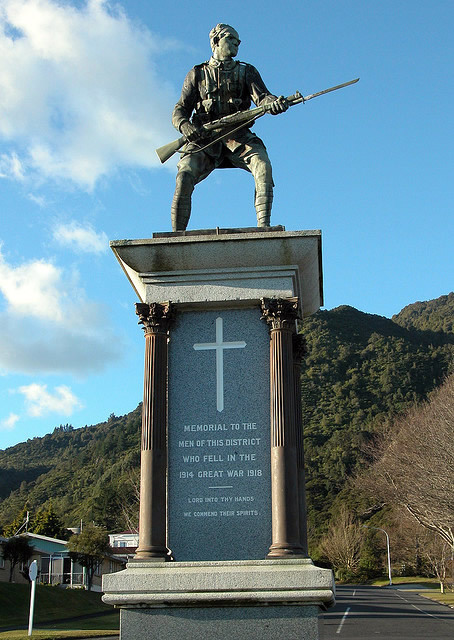 In fact no such public memorial was ever made in New Zealand; the closest being the aggressive bayonet thrust of the bronze soldier on the Te Aroha memorial, designed by Italian artist Giobanni and unveiled in 1923. Two major reasons account for this. The climate of the post-war years was characterised by peace and mourning. The aggressive and realistic image of the bomb-thrower did not suit the sombre, idealistic view of the New Zealand soldier and New Zealand’s role in the Great War. New Zealand authorities were also prejudiced against local artists during this period. They often failed to commission New Zealand sculptors and mistrusted home-grown talent. Regardless of whether Te Papa’s bronze ‘bomber’ is the original made by Fraser for his war memorial proposal, or Fraser’s copy of his own design, it is the history that it represents which is significant. That Fraser’s proposed memorial design was rejected in the post-war period, tells us a lot about the socio-political milieu in which our existing war memorials were created. I got here by researching my Grandfathers WW1 diaries … we was a specialist “bomber” in the Auckland Infantry Battalion (3rd Auckland Company) in Turkey and also on the Western Front. Lots of entries (especially on the Western Front) of bombing activity. There is a similar “bomber” bronze statue to this in the Hooge Crater Museum in Belgium. If you are interested, I can send you a picture of it ? One last thought, Fraser may have had Bernini’s David in mind when he created this piece. The movement of the piece does have the ‘torque’ of a baroque work. Have a look and see what you think. ps. I misspelled Apirana Ngata’s name in the previous post. Sadly, Alexander R. Fraser’s work was scattered after his death, as a result he is less well known than he should be. Fraser studied with Edwardo Lanteri, one of the finest teachers of his day, a friend of Rodin and Dalou. Lanteri’s excellent book on clay modelling is still in print (Dover Press). Are you aware of Fraser’s children’s fountain in the Wellington Botanical Gardens? There is also a small plaque with a dog’s head on one of the wharf buildings, dedicated to Paddy the Wanderer. Also in parliament there is a bronze bust of Sir Apirana Nata. Hi Mark – thank you! And thank you for adding more information to the artistic context of the time – greatly appreciated and makes me wish blogs could be longer! Yes, I had my reservations about the name ‘Giobanni’ also but copied it from my secondary source – I think that the name will have been originally ‘misrecorded’; there were other names in the Artist file too (referring to Fraser’s training) which were somewhat anglecised versions of what I recognised to be Italian names – definitely a complex task to delve into the history of these otherwise very-present, physical items from the past. A great article! It is interesting how, regardless how long it has been since the war, objects that commemorate battles, men and the war are still relevant and incredibly interesting! Thank you Hannah. I definitely agree, thanks for reading! This is great. More analysis of *the war* please. Thanks for your comment Charlotte. Keep an eye out for some feature Topics in Collections Online over the next few weeks – these will all give added context to the objects in our collection and various aspects of the First World War. Thanks Mike, these are great finds. Interesting how they all emphasise the sculpture’s lifelike appearance, and in a positive way too. It even received special notice by the King!